By Bus: Catch bus number 501 from the bus station. The bus travels down the Tettenhall Road. Get off the bus at the top of Connaught Road. Cross over the Tettenhall Road and walk along Connaught Road to the bottom. 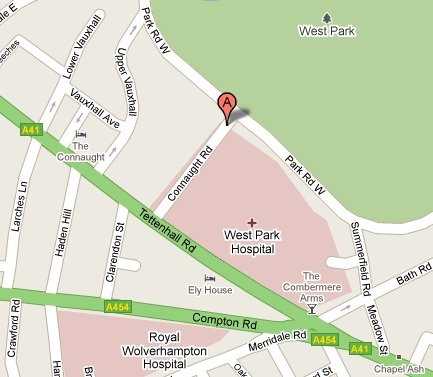 The church is situated at the corner of Connaught Road and Park Road West and will be on your left as you walk down. By Car: From the Wolverhampton Ring Road, follow the signs for Tettenhall. Drive along the Tettenhall Road until you see the sign for the West Park Church. The sign will direct you along Connaught Road. The church is situated at the other end of this road on your left hand side and is at the junction of Connaught Road and Park Road West. There is ample parking for cars around the church. Visitors most welcome. For more information, please do not hesitate to contact us.